ALEXANDRIA, Va. (April 8, 2014) — In today’s age where getting kids outside to exercise and enjoy nature can be more challenging than ever, Take Me Fishing™ and Walt Disney World Resort are making it easier for families to connect with the outdoors through fishing and boating. Beginning this month, The Recreational Boating & Fishing Foundation (RBFF) and its Take Me Fishing™ campaign are sponsoring the fun and educational family catch-and-release fishing and boating experiences offered to guests at the Walt Disney World Resort in Lake Buena Vista, FL. Three locations at the resort offer Take Me Fishing™ branded guided fishing and boating experiences. 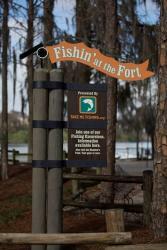 In addition, visitors to Disney’s Fort Wilderness Resort & Campground have the opportunity to participate in dockside fishing, while visitors at Disney’s Port Orleans Resort-Riverside can try their hand at cane pole fishing. Guests can also enjoy the “Take Me Fishing Challenge” recently introduced at Disney’s Fort Wilderness Resort & Campground. Guests who boat and fish at the Walt Disney World Resort will be encouraged to continue these memorable experiences at home by connecting with TakeMeFishing.org, which provides more information about where to boat and fish in their local communities. Parents can also find how-to videos to learn fishing basics as well as additional safety tips and advice. In addition to Take Me Fishing’s presence at the Walt Disney World Resort, they have a relationship with Disney Media Networks to spread the word about the benefits of fishing and boating. This relationship includes sponsorships on Disney Channel and Disney XD, activating through Radio Disney at popular events around the country, as well as integration of the Take Me Fishing messaging in online content and mobile apps. RBFF is a nonprofit organization whose mission is to increase participation in recreational angling and boating, thereby protecting and restoring the nation’s aquatic natural resources. RBFF developed the award-winning Take Me Fishing™ campaign to create awareness around boating, fishing and conservation, and educate people about the benefits of participation. Take Me Fishing helps boaters and anglers of all ages and experience levels learn, plan and equip for a day on the water. The campaign website, TakeMeFishing.org, features tips and how-to’s that can be used all over the country, tools to compare different styles of boats, information on how to get a fishing license and boat registration, and an interactive state-by-state map that allows visitors to find local boating and fishing spots. Walt Disney World Resort is a contiguous, nearly 40-square-mile, world-class entertainment and recreation destination featuring four theme parks (Magic Kingdom, Epcot, Disney’s Hollywood Studios and Disney’s Animal Kingdom); two water adventure parks (Blizzard Beach and Typhoon Lagoon); 35 resort hotels (25 owned and operated by Walt Disney World, including seven Disney Vacation Club resort properties); 63 holes of golf on three championship courses; two full-service spas; Disney’s Wedding Pavilion; ESPN Wide World of Sports Complex; and Downtown Disney, an entertainment-shopping-dining complex. Walt Disney World Resort also is included in Disney Cruise Line vacation packages. Located in Lake Buena Vista, Fla., 20 miles southwest of Orlando, Walt Disney World Resort opened Oct. 1, 1971. Open daily, year-round. Disney's Media Sales and Marketing group represents all advertising sales, marketing and promotions business for The Walt Disney Company's kid-driven and family-inclusive TV platforms, its wide range of online offerings, and its kid- and mom-focused radio platform. This includes Disney Channel, Disney XD, Disney Junior, Disney Online and Radio Disney.